The material is accurate, up-to-date and broken down into bite-sized sections. There is a "Q&A" and a "Key Takeaways" section following each topic to review questions commonly tested and to drive home key points. Also included is a comprehensive test containing the top 100 most commonly tested questions in pathology with the correct answers. To get the most out of this course, we recommend that you listen to the entire audio once while taking notes, then go back and listen to areas you had difficulties with. AudioLearn's Medical School Crash Courses support your studies, help with USMLE preparation and provide a comprehensive audio review of the topic matter for anyone interested in what medical students are taught in a typical medical school pathology course. 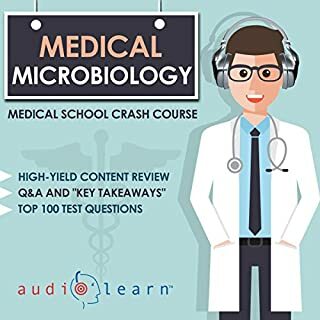 So: this is a highly useful resource for all types of medical, health or serious biology students. Upside of the internet we have such information online without sitting in a lecture hall. Would agree best use from listening through then going back to take notes or both notes on first listen if possible. There is a whole series of these medical school crash courses: you can download and listen off line. Good reading, story will only attract medical types obviously, overall: a winner. A helpful summary of pathology at senior medical school level. worth the listen if you're studying or generally interested.